It didn't take long for Hydrangea paniculata 'Limelight' to catch on around Atlanta. With smaller flowers than 'Grandiflora' (which can look weirdly huge in certain situations), but with larger blooms than the species, 'Limelight' has become the new late-July, early-August landscape feature. One, it is very easy to grow and very floriferous. The inflorescences are packed solid with florets which take on a lime-green hue, then turn pure white. Thus, you have a showier flower than the airy 'Tardiva' and 'Unique'. In addition, you have almost instant success at a time when it is hot and humid, as 'Limelight' is easy to grow and shoots up quickly. It's one of the 'Proven Winners' series. It was a couple of decades ago that another trendy plant stood in the same place as the above hydrangeas. In fact, at the time I was secretly horrified that someone had chosen Bradford pears for this spot on the terrace of the Piedmont Driving Club in Atlanta. I can't remember when they went away, but I was glad. They just never looked right to me. In a recent renovation of the club, the swimming pool is close to this spot, so it's nice to have some summer flowers. The fig vine on the wall below was hurt this winter, but it has come back, and most of the brown leaves are gone. The macrophylla hydrangeas (in the foreground, next to the Japanese maple) along this walkway were injured in the cold. There were a few blooms, but nothing like the usual June show. With a better winter, they should look good next year. But, back to 'Limelight'. A few years ago, a Sunday School class at my church asked me to draw up plans for a memorial garden. I struggled like crazy with a plan. 'Limelight' had just hit the market in a big way, so they planted several along a path. I was amazed that during their first season, they looked as if they'd been there forever. For me, 'Liimelight' is a problem. As I've mentioned, I live in a wooded section of the City of Atlanta. The deer, which started coming here in the late 1990's, do not let my paniculata and arborescens hydrangeas bloom. I had excitedly planted three 'Limelight' plants at the little house. The deer chomped their blooms this year (despite spraying, which I probably didn't do often enough, given the earlier rains), so all I have are little ball-like nubs on the ends of the branches. In the past few years, they've eaten the leaves, too, but this year it was just the blooms. In November, I'm moving them - where, I don't know. The deer don't mind coming right up to my house, so I've got to think of some sort of fence, where I can enclose all the things they love to eat. But to end on a happy note. I had to laugh when at age 97, Margaret Moseley called me up and said she had to have 'Limelight'. For four decades, she would comb nurseries for new plants to be the first to try them out. Last summer, she visited her cousin's garden and came back raving about his 'Limelight' hydrangeas. She immediately went out and bought one. The other day, she called to tell me about the plant. "It's just beautiful," she said. 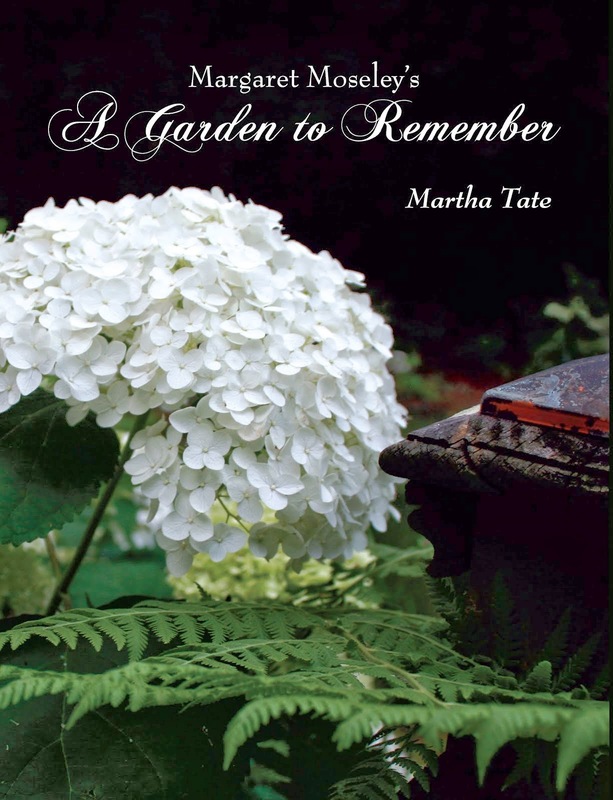 I'm going there today to get her to sign copies of the book I wrote about her (Margaret Moseley's A Garden to Remember), which has really caught on and is in its second printing. It tickles me that at age 98, someone is so excited about a plant. I'm sure she's not happy that she wasn't the first to have 'Limelight', but knowing her, she's already gotten a lot of people to plant this sun-loving hydrangea. Martha: Marney and I love working in our yard. We have been transplanting perennials and spreading "the love" to neighbors and friends. We found the limelight this year and LOVE it. We have 2 as anchors in one of our perennial beds. You are so right. It looks like it has been there for years. They never lot a beat from the pot to the ground. I love reading your articles and your pics. Is Margaret Moseley's garden on a tour of homes. I would love to see more. Your book is on my list to buy just haven't got there yet.